Uttar Pradesh(UP) Assembly/ Vidhan Sabha Elections 2012 Phase 1 will be held on 8th Feb (Wednesday) for total 55 assembly constituencies in state. The polls will be held from 7 AM on 8th February, earlier Phase-I Election was rescheduled from to 8th February from 4th February on account of the Barawafat festival, which may fall on 4th Febuary. So now new date is 8th February 2012. The regions of Uttar Pradesh that go to polls on 8th Feb are the eastern regions of Terai belt which mostly has districts bordering Nepal and some parts of Central UP. BSP and SP hold the majority here, though Congress did make its mark in the region during 2009 polls. 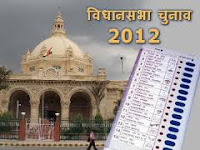 The districts that will go to polls are Sitapur, Barabanki, Faizabad, Kanpur Dehat, Bahraich, Shrawasti, Balrampur, Gonda, Siddharthnagar and Basti. The first phase begins on 8th Feb and the final 7th phase ends on 3rd Mar. The 2012 election results will be declared on 6th March (Tuesday).